Help better understand yourself as a creative with this free Book of Ideas sample. Here at Creative Bloq, we know how important it is for creatives to nurture their happiness and wellbeing. This is a feeling very much shared by creative director Radim Malinic, evidence of which can be found in his new book, Book of Ideas Vol.2, which offers holistic guidance on better understanding yourself as a creative, and the best ways to approach your life and work in a mindful, smart way. With this in mind, we've teamed up with Malinic to offer every Creative Bloq reader this exclusive free excerpt of Book of Ideas Vol.2, which includes snippets from all three chapters – Work, Creativity and Mind – providing helpful insights and tips on how to improve your working process, build your career path and the benefits of working in silence and breaking stale, everyday habits. To download your sample copy of Book of Ideas, Vol.2, simply fill out the form below and we'll deliver it directly to your inbox. Want more? 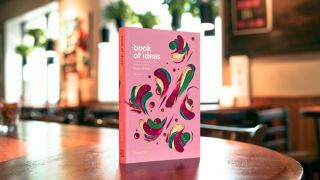 You can purchase the Book of Ideas, Volumes 1 and 2, and other products, from Radim Malinic here.